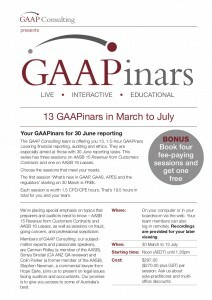 Our series of 13 GAAPinars starts on 30 March with our customary What’s new with GAAP, GAAS, APES and the regulators’ and its Free! Our sessions are designed for the audit teams of public practitioners, and finance teams of corporate and not-for-profits. 19.5 hours of CPD/CPE – choose the session (s) that meet your needs. A session price is $297 and discounts are available. Where? On your computer or in your boardroom via the web. Your team members can also log-in remotely. Can’t do the scheduled time, now worries – recordings are provided to all subscribers. A description of each session is provided in the brochure.